An objection by Sen. Mike Lee (R-Utah) to passing H.R. 299, the Blue Water Navy Vietnam Veterans Act of 2018, by unanimous consent on the Senate floor Wednesday has effectively doomed any chance of the bill being passed in the 115th Congress. Lee now joins Sen. Mike Enzi (R-Wyo. ), who objected last week due to the bill’s overall cost. Lee’s objection was because he wants to wait and see more sufficient evidence. “We don’t need more sick veterans to prove sufficient evidence,” said VFW National Commander B.J. Lawrence. “Agent Orange made Vietnam veterans sick, and science agrees that there isn’t any reason to treat so-called Blue Water Navy veterans any different than their peers who served ashore or on the inland waterways of Vietnam,” he said. “What both senators have done is fail thousands of veterans — many of whom reside in their home states. Their obstruction to this bill’s passage forsakes our nation’s promise to take care of those who were injured or made ill due to their military service. Their objections put cost above faithful and honorable service.” Read more. The VFW is again calling on all members and advocates to demand that the Senate pass H.R. 299 before the end of the year. Make your voices heard. Blue Water Navy Bill Must Pass! Or Call (202) 224-3121 and ask to be transferred to your Senators. As Veterans Day gets closer, it’s more important than ever to show our appreciation to our veterans and active duty military who put their lives on the line for our freedom. 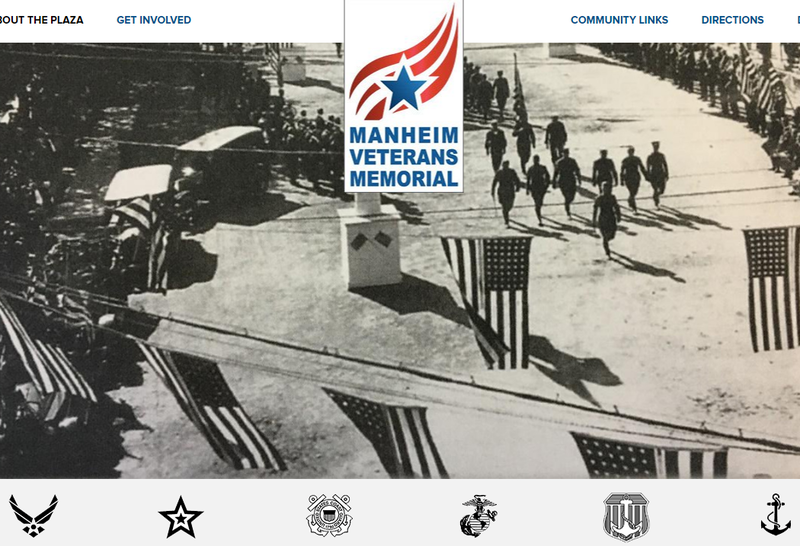 Will you take a moment to send a card to a hospitalized veteran or deployed service member? It really means the world to them when they receive cards. Visit this website for more information and ideas. Throughout the Korean war, the United Nations Command regularly requested that the CPVF and Korean People’s Army (KPA) provide lists of American and allied servicemen held in their custody. Many missing servicemen never appeared on any of the lists provided. On June 12, 2018, President Donald Trump met with North Korea Supreme Leader Kim Jong-un in Singapore, in the first meeting between the leaders of the United States and North Korea. The leaders signed a joint statement, including a commitment to return the remains American service members lost in North Korea. On July 27, 2018, North Korea turned over 55 boxes, purported to contain the remains of American service members killed during the Korean War. The remains arrived at Joint Base Pearl Harbor-Hickam, Hawaii on Aug. 1, 2018, and were subsequently accessioned into the DPAA (Defense POW/MIA Accounting Agency) laboratory for identification. Scientists from DPAA and the Armed Forces Medical Examiner System use various tests, such as mitochondrial DNA (mtDNA) analysis, dental, anthropological analysis and radiograph comparison analysis, as well as circumstantial and material evidence, including a single identification tag that was included in the July 27, turnover. DPAA has stated that is grateful to the government and people of the Democratic People’s Republic of Korea, and looks forward to the continued fulfillment of the commitment made by President Trump and Chairman Kim on the return and recovery of U.S. service members in North Korea. Today, 7,677 Americans remain unaccounted for from the Korean War. Using modern technology, identifications continue to be made from remains that were previously returned by North Korean officials or recovered from North Korea by American recovery teams. The names of those missing from the Korean War are recorded on the Courts of the Missing at the National Memorial Cemetery of the Pacific in Honolulu. Rosettes are placed next to names when the remains are accounted for. For additional information on the Defense Department’s mission to account for missing Americans who went missing while serving our country, visit the DPAA website at www.dpaa.mil, Facebook page www.facebook.com/dodpaa or call (703) 699-1420/1169. -- Army Master Sgt. Charles H. McDaniel, 32, of Vernon, Ind., whose remains were previously identified, will be buried Oct. 27 in Greenwood, Ind. McDaniel was a medic with the 8th Cavalry Regiment Medical Company supporting the regiment's 3rd Battalion. In November 1950, his unit was engaged with enemy forces of the Chinese People's Volunteer Forces (CPVF) southwest of the village of Unsan, and east of Hwaong-ri, North Korea. He was reported missing in action on Nov. 2, 1950, when he could not be accounted for by his unit. Read about McDaniel. -- Army Sgt. James K. Park, 20, of Beaumont, Texas, whose remains were previously identified, will be buried Oct. 27 in Barry, Texas. 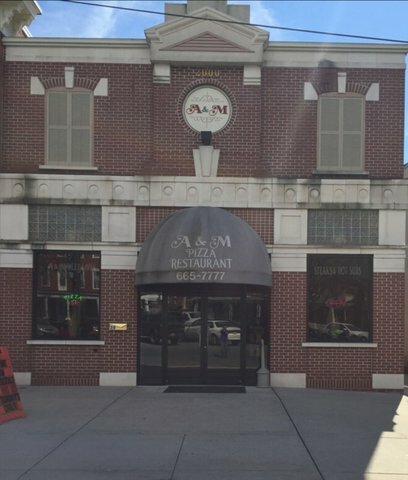 Park was a member of Company I, 26th Infantry Regiment, 1st Infantry Division. On Nov. 23, 1944, Park was declared missing in action after being wounded while his unit was engaged in fierce fighting within the Hürtgen Forest in Germany. Soldiers from Park’s company attempted to search for him, but were prevented from doing so due to sustained fighting in the area. On Nov. 24, 1945, his status was amended to deceased. Read about Park. -- Marine Corps Reserve Pfc. Paul D. Gilman, 19, of Belen, N.M., whose remains were previously identified, will be buried Oct. 26 in his hometown. Gilman was a member of Company M, 3rd Battalion, 8th Marine Regiment, 2nd Marine Division, Fleet Marine Force, which landed against stiff Japanese resistance on the small island of Betio in the Tarawa Atoll of the Gilbert Islands. Over several days of intense fighting at Tarawa, approximately 1,000 Marines and Sailors were killed and more than 2,000 were wounded. Gilman died on the first day of the battle, Nov. 20, 1943. Read about Gilman. -- Mr. George L. Ritter an employee of Air America Incorporated, was piloting an Air America C-123K from Udorn Airfield, Kingdom of Thailand, headed for Xienhom District, Xaingnabouli Province, Laos. The aircraft was on a routine resupply mission for U.S. Agency for International Development and was last heard from when they were northeast of Sayaboury, Laos. Search and rescue efforts were continued through Dec. 31, 1971, but no sign of the aircraft or the four crew members were found. Ritter was subsequently reported missing. Interment services are pending. Read about Ritter. -- Merchant Marine Wiper Elvis N. Spotts was a crew member of the SS Cape Isabel, part of a convoy of three ships including the USS Grayson and the SS Cape Fear. On Feb. 22, 1944, the ships were approximately 12 miles off the coast of Tarawa Atoll. The two Merchant Marine vessels were bringing supplies to Betio Island. Spotts was electrocuted during bilge maintenance. He was unable to be revived. Interment services are pending. Read about Spotts. -- Marine Corps Sgt. Dwight W. Randall was a member of Company C, 2nd Amphibian Tractor Battalion, 2nd Marine Division, Fleet Marine Force, which landed against stiff Japanese resistance on the small island of Betio in the Tarawa Atoll of the Gilbert Islands, in an attempt to secure the island. Over several days of intense fighting at Tarawa, approximately 1,000 Marines and Sailors were killed and more than 2,000 were wounded, but the Japanese were virtually annihilated. Randall died on the first day of the battle, Nov. 20, 1943. Interment services are pending. Read about Randall. -- Navy Fireman 1st Class Angelo M. Gabriele was assigned to the battleship USS West Virginia, which was moored at Ford Island, Pearl Harbor, when the ship was attacked by Japanese aircraft. The USS West Virginia sustained multiple torpedo hits, but timely counter-flooding measures taken by the crew prevented it from capsizing, and it came to rest on the shallow harbor floor. The attack on the ship resulted in the deaths of 106 crewmen, including Gabriele. Interment services are pending. Read about Gabriele. -- Navy Fireman 1st Class Grant C. Cook, Jr. was stationed aboard the USS Oklahoma, which was moored at Ford Island, Pearl Harbor, when the ship was attacked by Japanese aircraft on Dec. 7, 1941. The battleship sustained multiple torpedo hits, which caused it to quickly capsize. The attack on the ship resulted in the deaths of 429 crewmen, including Cook. Interment services are pending. Read about Cook. Congratulations to raffle winner; Bill from Lancaster, PA who has won a. Gift Certificate to A&M Pizza & Sandwich Shop. Thanks to the owners of A&M Pizza & Sandwich Shop for the gift certificate! When Navy Chief Johnathon Stone’s wife, Sarah, was diagnosed with a rare terminal cancer, he knew his family had to make the most of every moment. After all, they had always believed there is good in every day…sometimes you just have to find it. 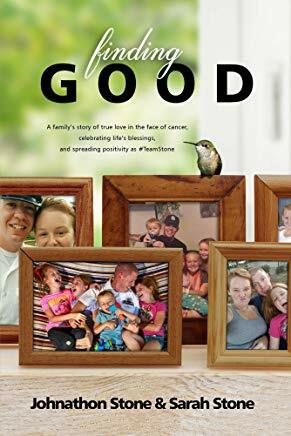 "Finding Good" is a firsthand look at the story of Sarah and Johnathon from falling in love in high school, to moving across the country and raising four children, to spreading hope to the world through acts of kindness, and handling life’s ups and downs as Sarah battled appendix cancer. No matter what challenges you face, if you look hard enough, there will always be something good. 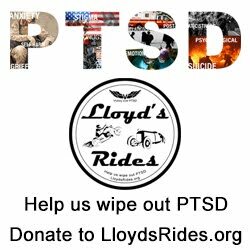 Lloyd's Rides is honored to be helping one of our veterans. Robert Quinn, who served in Vietnam, is a published writer who deserves to have many more readers than he currently has. Quinn's book "San Ernesto's Shadow" was made available online in 2011, but sales have been poor due to lack of promotion by the publisher. Lloyd's Rides founder Randy "Hoss" Caldwell met Quinn when they were both seventh graders in Manheim Township, Pennsylvania and they've been friends ever since. Set in Texas, near the Mexican border, it is a story of an Oilman near Houston who gives his ranch back to descendants of the Mexican family who lost it in 1836. This brings the world to his door, with both praise and criticism. It makes him an instant celebrity on an international level and changes his life forever, making him the hero of millions but putting a high price on his head. One Reader's Review of "San Ernesto's Shadow"
I quite enjoyed reading this book. The protagonist sets out to correct the misdeeds of his forefathers, but although his fans try to put him on a pedestal, he realizes he is just a flawed human being like everyone else. So his attempts to contribute to making the world a better place don't come off as "preachy" because he admits that he is no saint. The story reminded me a bit of Magnificent Obsession and White Banners by Lloyd C. Douglas, classics that I have loved for decades. In addition to promoting Quinn's book on our blogs, Facebook page, and at live events, we will be assisting him in getting his other works published. These include three more full length novels, two dozen short stories and hundreds of poems (called "Rough Rhymes" by Quinn). We encourage you to read "San Ernesto's Shadow" which is available at Amazon in Kindle e-book format. If you'd like to know about Quinn's other works once they are available, please "like" our Facebook page or subscribe to our blog updates. "We have recently added a surprise flight for our veterans on Sunday, November 11, 2018 (Veteran's Day). At this time, we do not have any letters for our vets to open during "Mail Call" and are desperately in need of them (we need at least 160). If you could find it in your heart to pop a card or a quick note in the mail, it would be GREATLY appreciated. We are doing our best to serve Vietnam veterans at this time since they did not receive their deserved "Welcome Home" the first time around. If you have any questions, please let me know! THANK YOU! "Honor Flight Network is a non-profit organization created solely to honor America’s veterans for all their sacrifices. We transport our heroes to Washington, D.C. to visit and reflect at their memorials. Top priority is given to the senior veterans – World War II survivors, along with those other veterans who may be terminally ill.
Of all of the wars in recent memory, it was World War II that truly threatened our very existence as a nation—and as a culturally diverse, free society. According to the Department of Veterans Affairs, an estimated 640 WWII veterans die each day. Our time to express our thanks to these brave men and women is running out." The17th Annual Cruise, Model Car Show & Chicken BBQ at the Rheems Volunteer Fire Department in Elizabethtown, Pennsylvania was not a huge success this year, due to the rain. Only about 50 die-hard hot rodders showed up for the cruise, and as of noon there was only 1 biker. Here are some photos we took. Hopefully next year's event will see better weather! that he raced. It had 400 hp. Hoss worked with Barry at Philips surveillance cameras. Barry bought this car new in 1962. This Saturday (September 8, 2018) our booth will be set up at the 17th Annual Cruise, Model Car Show & Chicken BBQ at the Rheems Volunteer Fire Department, 350 Anchor Road, Elizabethtown, Pennsylvania. The ​Cruise-In takes place from 9 am to 2 pm, and the BBQ pickup is from 10 am to 1 pm. Registration begins at 8 am. A special thanks to John for his help getting our space. We'll let you know whereabouts our stand will be, once we get that info. Tending the booth with be Lloyd's Rides founder Randy "Hoss" Caldwell with his son-in-law Rich helping out. Be sure to stop by and say "hi"!